Will the real fried chicken please step forward? Whew….. I do love fried chicken!!!! Probably a lesser known fact about me, or so I thought. Imagine my surprise when I walked into the office on my birthday (back in August) and found a large poster plastered over the window by my desk sporting a famous swimmer with my face photoshopped onto their face – I know, but wait, it gets better; this poster had a series of this crazy image spanning a length of 6 feet. Not crazy enough? Okay, so pasted on top of the poster, in between each series of my face, as if in the foreground, kind of dancing on the water, was an enormous image of a fried chicken leg. Now I’m a thigh girl myself but, this leg looked pretty tasty too. Hysterical as it was, I found myself a little mystified that my co-workers found this to be a prevalent part of who I am. Ironically though, that night Tom and I had planned dinner out at Bastille in Ballard, solely based on a craving we both had for their chicken. Now, I didn’t really consider it to be fried nor does it present itself that way on the menu. One bite in however, revealed to me that I was indeed eating fried chicken. No, it did not sport a chunky coat of fried deliciousness; it was more of a crackly but sophisticated number. It had been basted in honey and roasted to perfection! The skin crisply protected the inner meat to reveal itself in succulence bite after bite, the moistness coupled with juicy, the crackly and crunchy. The flavor! Just like good fried chicken should taste – even if they do say it is roasted! Back home that same evening, I opened up my gifts; Tom tends to spoil me a bit. In addition to a necklace designed by a surfer meant to stay on while swimming, Irony strikes again when I opened up Lisa Dupar’s book titled “fried chicken & champagne“! I couldn’t help but smile and laugh out loud. What was the universe telling me? Perhaps on the day of my birth, the universe was trying to remind me of my roots. I grew up with the real thing, fried chicken so good that I still anticipate my visits home to Alaska knowing that I will be greeted at the airport by my Mom, her boyfriend John or my brother Mark, carrying with them a satchel of Grandpa’s fried chicken. That unmistakable smell lures me into the car biting into piece after piece until I have shamefully devoured the whole thing. John always remembers to bring me gizzards which are truly one of my guiltiest pleasures. They are boiled for hours and fried to perfection; I dip them into homemade Roquefort dressing, pop them into my mouth one after the other. When I return home on the plane and when family comes to visit me in Seattle, there is usually a pack of freshly fried chicken in the overhead compartment of the plane, leaving the other passengers either really annoyed, really jealous or both. Grandpa owns The Lucky Wishbone, a restaurant, an Alaskan institution. They opened their doors 58 years ago come November serving air fresh, hand dipped, pan-fried chicken, old fashion burgers and hand-stirred milkshakes. Grandpa is 91 and can still be found bussing tables and commanding orders; but mostly you will find him perched at the counter chatting it up with his long-time customers/friends talking about fishing, flying, women and golf. There is a sign posted over the counter that reads, “Golf and aviation seminars held daily”. Growing up, we sometimes went to Grandma and Grandpa’s house for dinner on Sunday when the restaurant was closed. Grandma would make fried chicken that confused me; it was not crunchy at all like it was at the restaurant but it was something I looked forward to none the less. I have had many versions of fried chicken through out the years, some particularly good ones at family meal while working at Etta’s years ago, and some not so good, during weak moments fished out of the market deli case. I have had “fancy fried chicken” ordered off poetic menus at hip eating spots (even sans-bone presented on a stick) and not so fancy from roadside bars or drive up windows. Fried chicken is not something I cook traditionally at home; way too much work and splattered mess to do it right. I do however love frying boneless, skinless, chicken breasts. I cut them into long strips and slather them in buttermilk with lemon juice and let them sit that way for at least two hours or overnight. I then mix a few handfuls of flour with fresh ground pepper, salt, cayenne and smoke paprika until the seasoning tastes just right. I remove the chicken from it’s bath and dredge it thoroughly through the mixture of seasoned flour. In my cast iron skillet, I heat some oil, (peanut, canola or olive depending on what I have), until it is very hot. As the chicken hits the oil, it sizzles and spits and a delicious odor rises from the pan. After a few minutes it is ready to be turned and then a few minutes more, once the crispness has encased it, I remove it to a towel to drain while I plate whatever it is that I have decided to serve alongside or beneath. Sometimes a simple salad dressed with fish sauce mixed with lime juice, chilies and sugar. 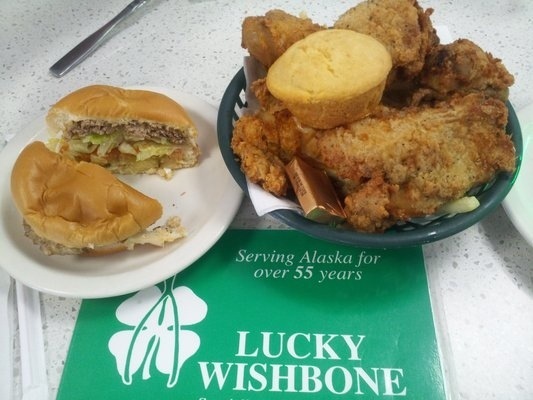 When I think about real fried chicken, I always think Lucky Wishbone! This morning however, it was fried chicken and champagne. Ever since my birthday, I have been craving it with waffles as shown in Lisa Dupar’s book. 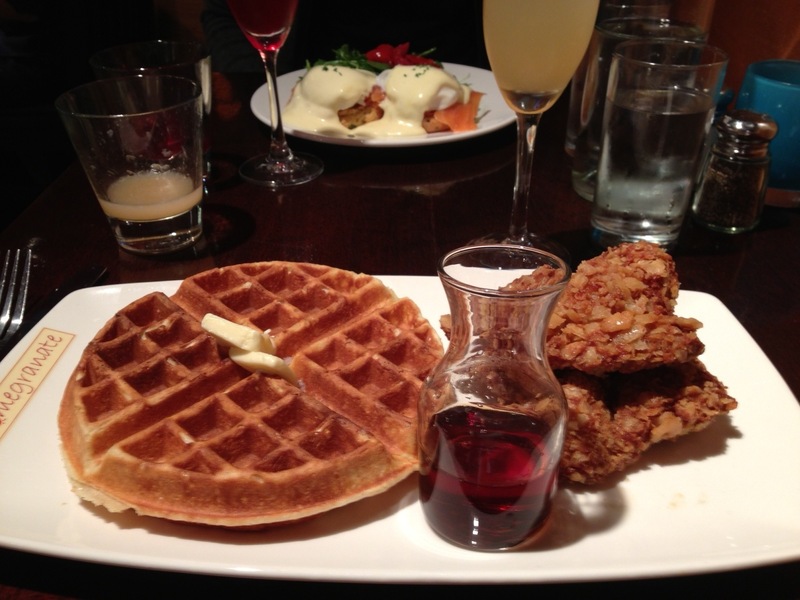 So we finally went to her restaurant, Pomegranate Bistro, for brunch to get fried chicken and waffles with a glass of champagne. The restaurant felt very homey and inviting, like a dressed up modern day version of what the Wishbone could be. Our waiter was friendly and familiar like a young version of my brother, Mark. 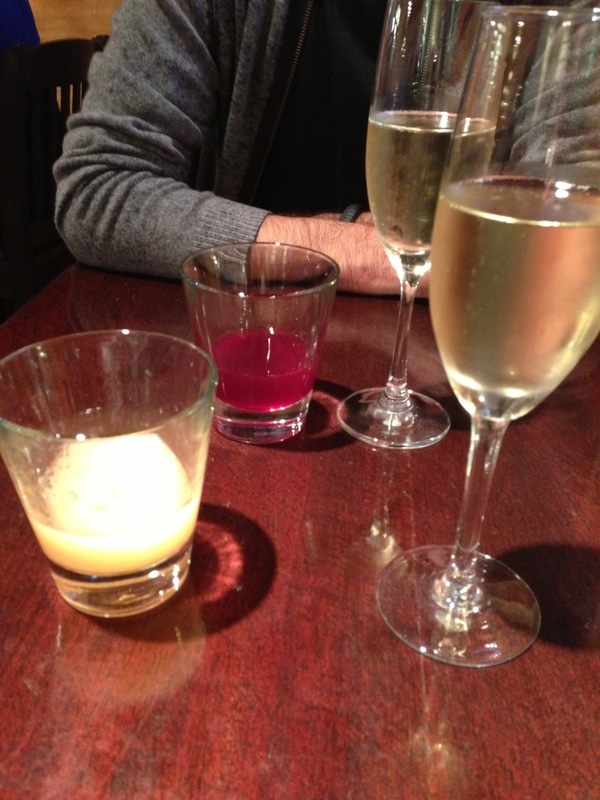 We each ordered a mimosa with the juice held to the side. When the drinks were brought to our table, my “young brother” commented that he had never seen them deconstructed before. How else was I going to have fried chicken and champagne? Brunch was served and the waffle was light and fluffy, pairing well with the thick coat of the chicken. Dipped in maple syrup, it reminded me that I like to dip my fried chicken in honey like my Grandma taught me to do. 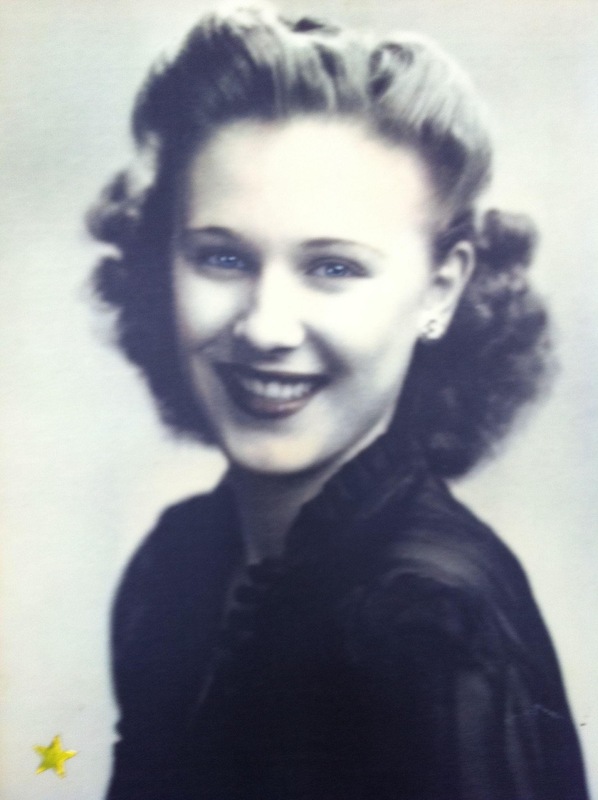 She always had a cup of coffee with a dollop of vanilla ice cream to make it sweet. 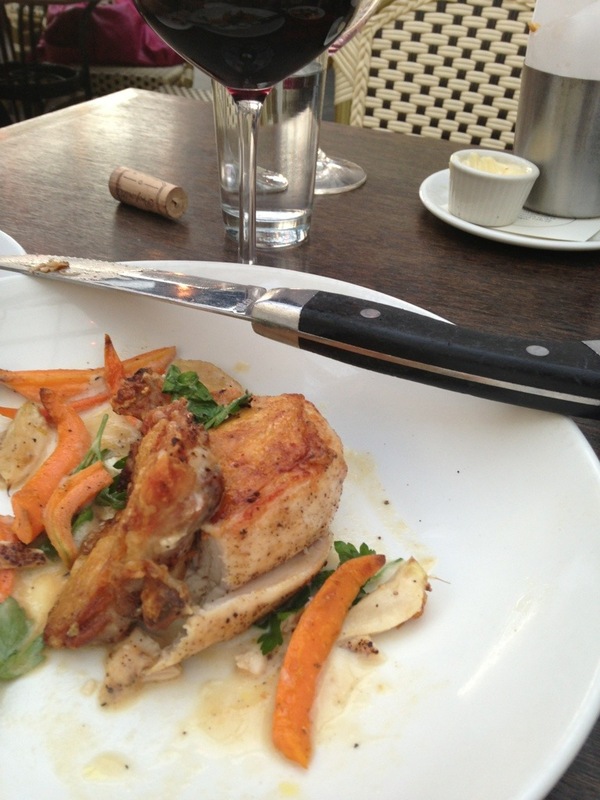 If she were dining with me now, I bet she would also enjoy her chicken with champagne. …makes me hungry too – for Wishbone fried chicken that is! I have big eye tuna awaiting me in the ‘fridge (along with Manila clams and fresh East coast scallops) but all I can think about is fried chicken. No chicken in sight, so making burgers instead! Your comment made my day! Thanks. Well… I guess you know what I want for Christmas (wink, wink)! What a lovely entry – thank you for sharing! So many memories in our lives revolve around food…I couldn’t imagine anything better. Thank you. Indeed, most of my favorite memories involve food. We enjoyed our visit to Pomegranate and look forward to new memories on our return. Until then, I’ll be right here and hope you’ll stop back by! What an enjoyable blog, I enjoyed every minute of it bringing back many good memories of the past, I believe I was the second waitress that Geo and Peggy hired at the bone, I dipped the hard ice cream and still have a good muscle because of it. Would so enjoy meeting you one day but until then I’ll enjoy your blog. I return to Anchorage once or twice a year and always have lunch at the bone with Geo. Love that fried chicken. Thank you for that! Perhaps one day we will cross paths and share memories and fried chicken. Nice to hear from you and thank you for sharing. I can imagine how different working there was when you were 16 from when I was 16. If we ever find ourselves in AK at the same time, I’ll meet you at the Bone and we can share stories! I bet you don’t miss the cold though. Instead of fried chicken and snow, it is blue skies and chilies! I love the mix of food and stories. Food brings back some of my most vivid family memories, especially of those we miss. Your Grandmother was a pretty young woman, Stacey. She had a lovely smile but I bet it was those eyes are what caught your Granddad’s attention. They do sparkle, don’t they?